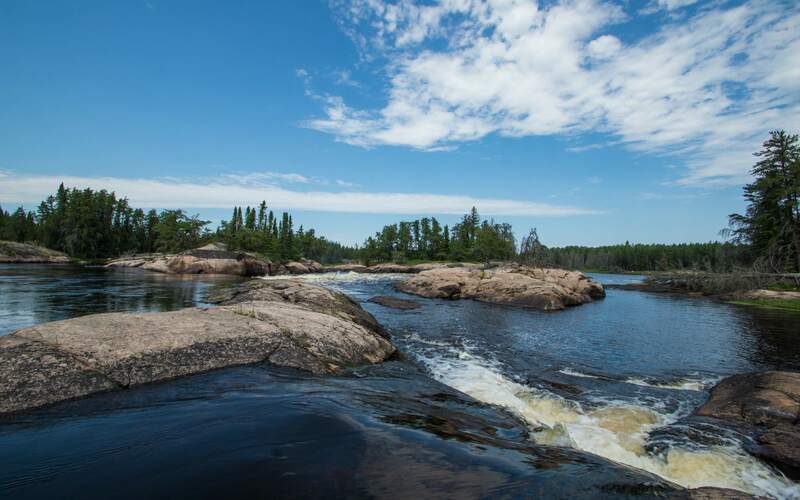 rapids/portages: a “lite” day. See map 4 in Wilson’s book for overview and specifics. campsite: Namay Falls Convention Center! Room for fifty tents…we had first choice! I’m not sure what happened to Day 14 of my Garmin Oregon gps tracks; I think I may have deleted the file! What you see below is the equivalent – and much less detailed – track created by my SPOT Connect. It records a location point every ten minutes while it is on; this gps “bread crumb” trail is posted at the SPOT website where anyone you’ve given the link to can follow your progress. 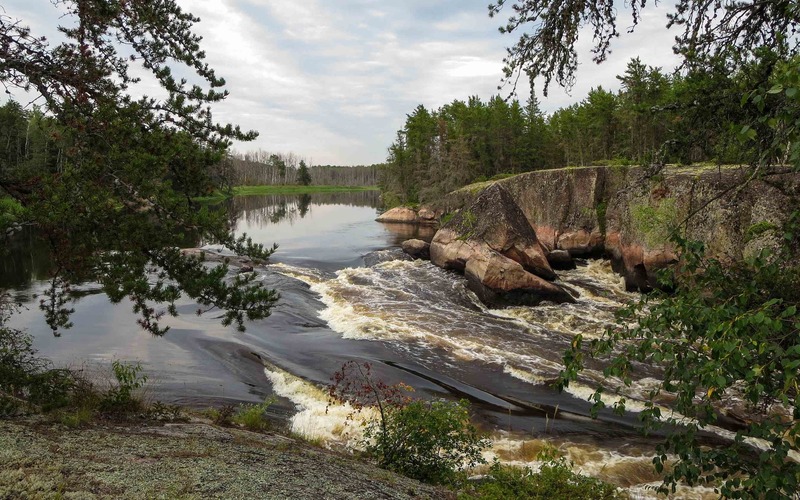 Our families like the emergency alert feature as well as the peace of mind it gives so it has become a part of how we do canoe trips these past few years. The Spot is 3″ x 2.6″ x 1.2″ (7.6 cm x 6.6 cm x 3.2 cm) and weighs 5 oz. (140 gm). Paired with my iPod Touch it also allows us to send up-to-45-character messages to pre-installed email addresses. See here for a good write-up of the device and its features. 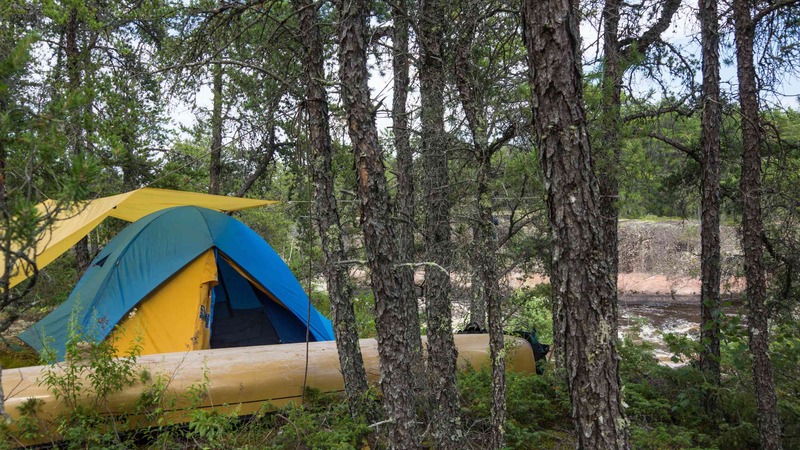 You will also notice where I “borrowed” the image – so thanks to the staff at trailCamper for the info and image! I also bring along a 5000 mAh battery charger for the iPod (just in case) and a couple of extra sets of AA batteries for the SPOT. Oh – and a usb cable to connect the SPOT to the charger. 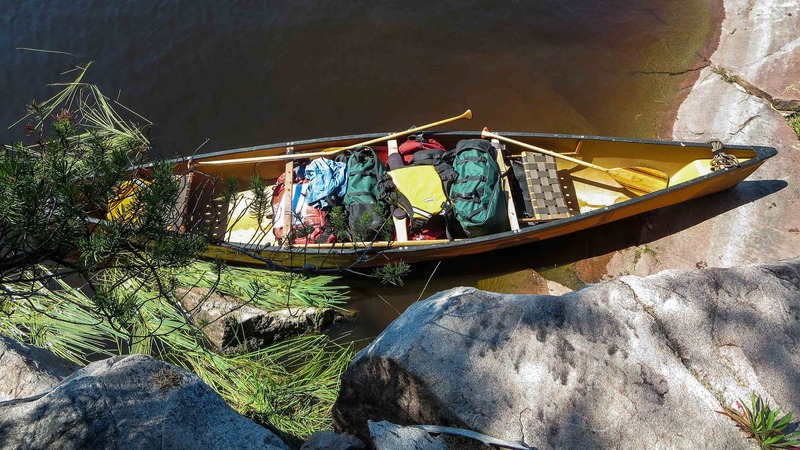 These are a few of the things a modern-day voyageur has to remember to bring along! 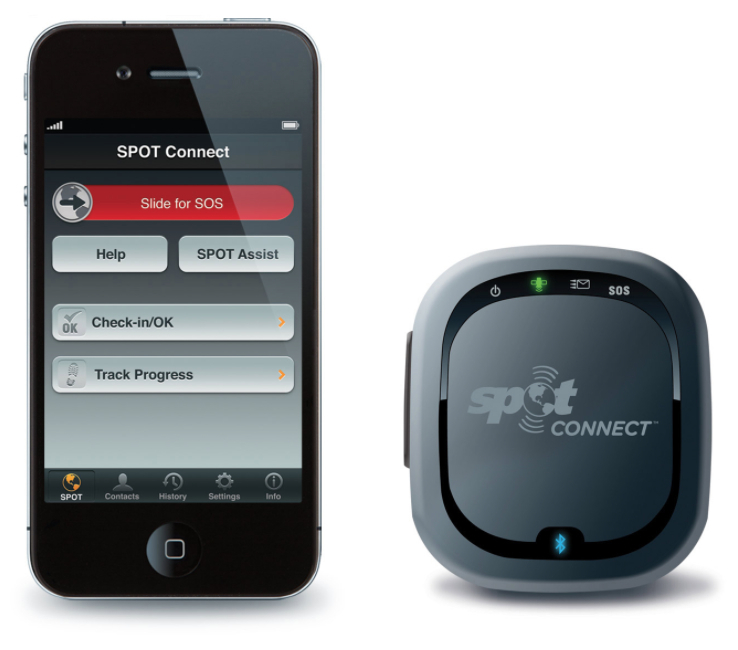 Update: the Spot Connect has been discontinued. The Spot Satellite Messenger Gen 3 now seems to be the Spot tracking device option. See here for more info. These days the Delorme Inreach is perhaps a better – a much more capable – device to invest in. It actually allows two way communication. It does, however, cost twice as much. Info here. Outdoor Gearlab has a review of the various choices here. They like the Delorme. BTW the Delorme company was recently bought by Garmin. 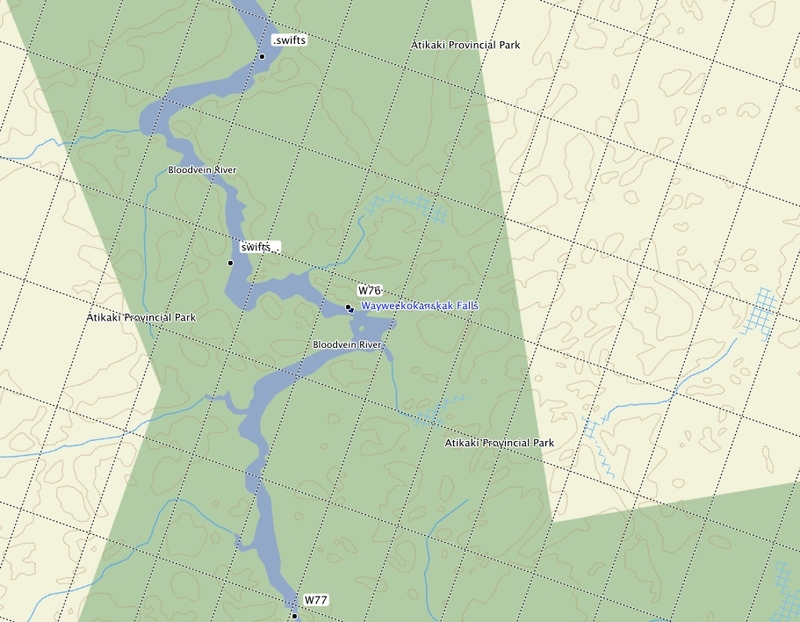 Looking at the Google satellite view and then the map below indicating the Atikaki Park corridor, it is interesting to note that the denuded area on river left goes right up to the boundary line. Is it logging activity that is responsible? A bit of surfing the net did not turn up any supporting evidence – there could be another explanation that I am not seeing. Any further information would be appreciated – let me know! After a couple of 30+ kilometer days, this one was more leisurely and whatever short portages we had to do also gave us lots of reasons to slow down and pull out the cameras. The shot below came from a “gorp and gatorade” stop below a nice piece of vertical rock face. Also in evidence again this day were the swifts that occasionally pushed the speedometer up into the double digits! 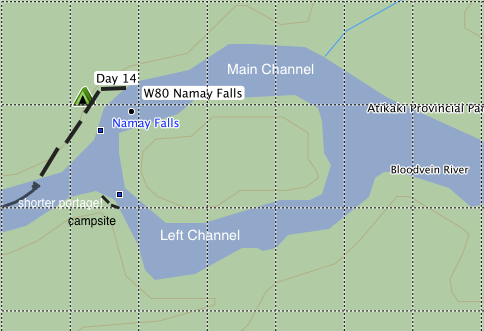 The Basecamp map below shows two such spots as we approached Wayweekokanshok Rapids (W76). 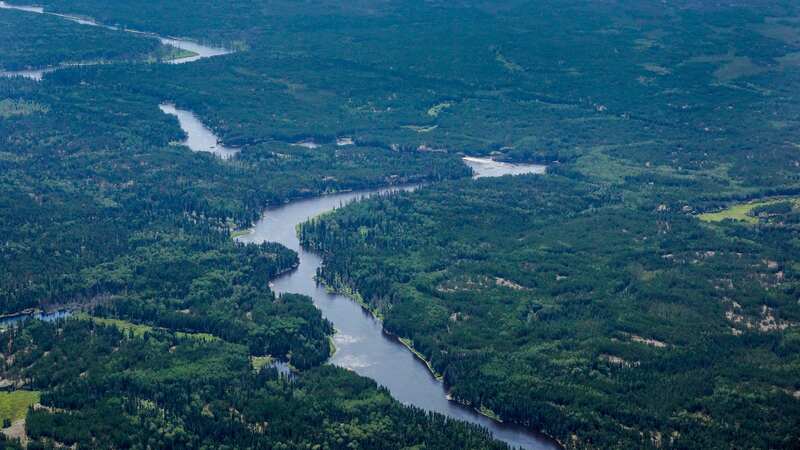 By chance I would take an aerial shot of this stretch of the Bloodvein during our de Havilland Beaver flight back to Red Lake a few days later. 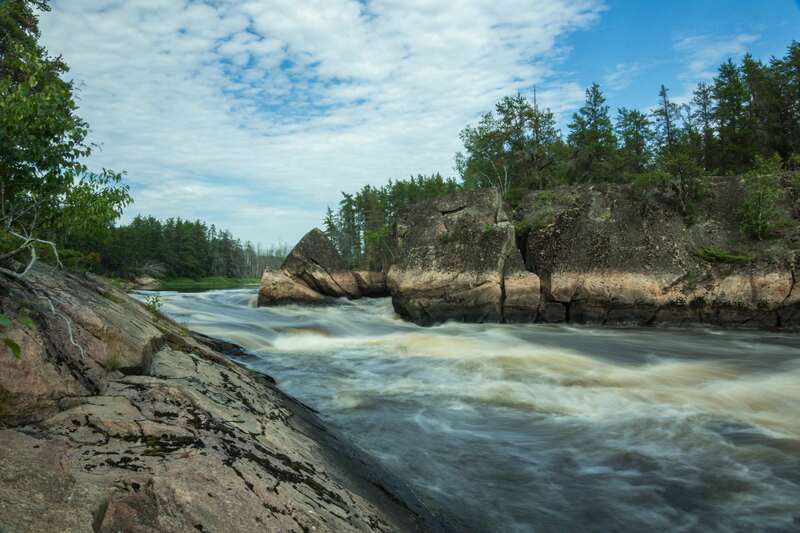 The two most impressive sets of rapids of the day were Ankuasi Falls and Namay Falls. 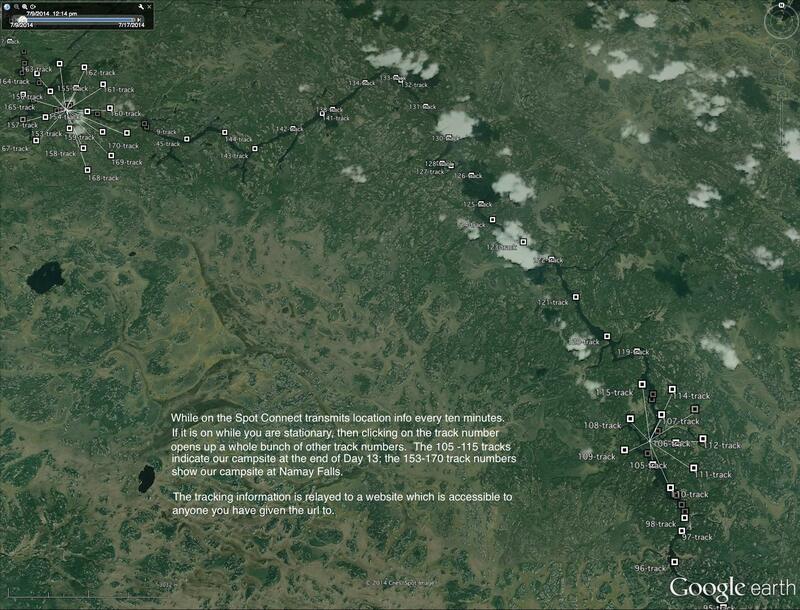 The maps below give you a general idea of where and how long they are. 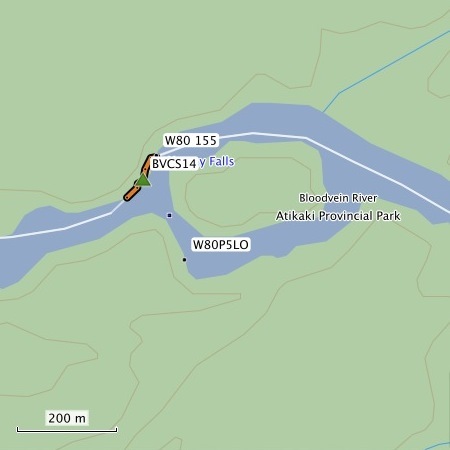 Again, fresh orange prospectors’ flagging tape indicated the take-out points (both high water and low water) . Apparently the word “ankuasi” means “driftwood” in Ojibwe. 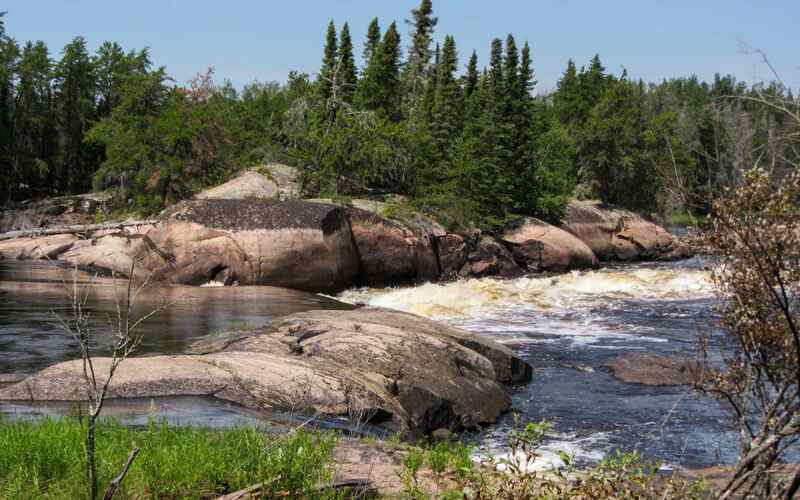 (Spellings like aangwasag and aungwahsug reveal the roots of the word.) 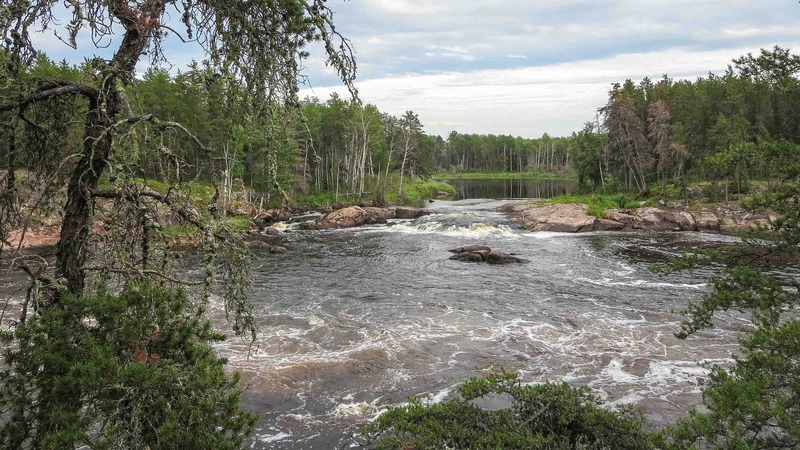 The connection became clear as we approached the falls and saw the pile of logs and deadfall washed up on the left hand side of the falls. We ended up spending almost two hours at the Falls, as it made a great lunch spot and a reason to get out the cameras again. Namay Falls is a half-hour paddle from Ankuasi Falls. We got to the take-out spot just above the falls after having checked out the high water exit perhaps fifty meters upriver. The start of the portage is a bit muddy and you’re faced with a steep first section that brings you to the flat hill-top. Walking across it we could see dozens of potential spots to put up our tent. It was easy to imagine an Anishinaabe band making this a temporary home for a part of the summer. We picked a nice spot overlooking the rapids and set up the tent there. Like we had on a number of earlier days, we now declared this campsite the #1 of the trip. 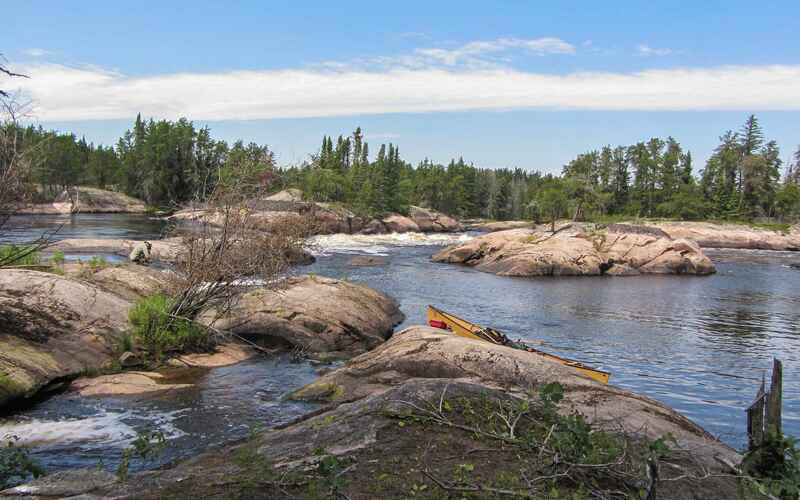 The Bloodvein definitely spoils you with fantastic places to park your canoe for the night. Needless to say, there was nobody else there. 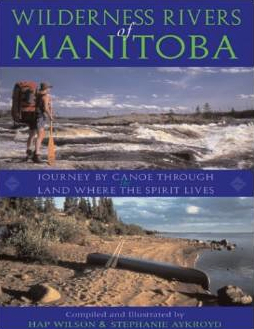 In fact, other than the two fishing boats on the Manitoba side of Artery Lake on Day 7 and the teen crew at W70 on Day 13, we did not meet anyone else on the river until the last night when fishing boats from Bloodvein Village passed our campsite some 8 kilometers from the end. 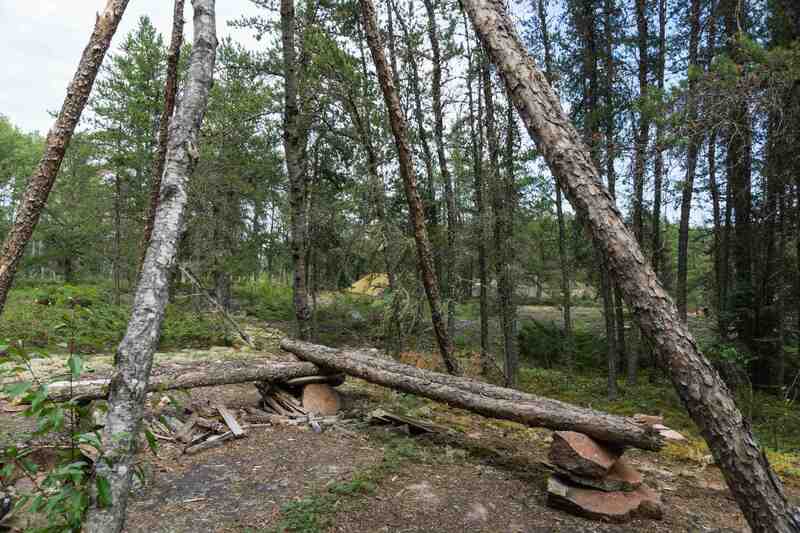 We did see the teepee structure below that perhaps serves as the framework a temporary shelter for Bloodvein villagers when they make the forty kilometer trip up to Namay Falls on hunting trips. 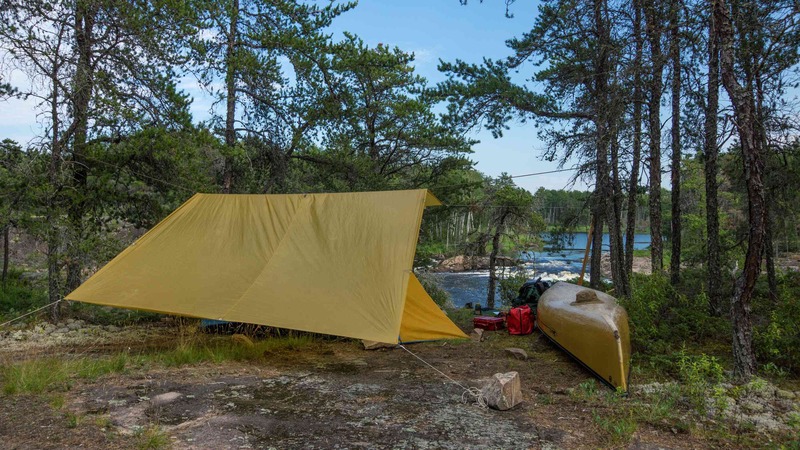 Or maybe canoe trippers with an extra day to kill decided to make use of their time building something they could wrap a tarp around? We had approached Namay Falls on river right and did the steep ascent to the scenic and massive campsite on the flat top of the sloped rock face that lines the falls on this side. 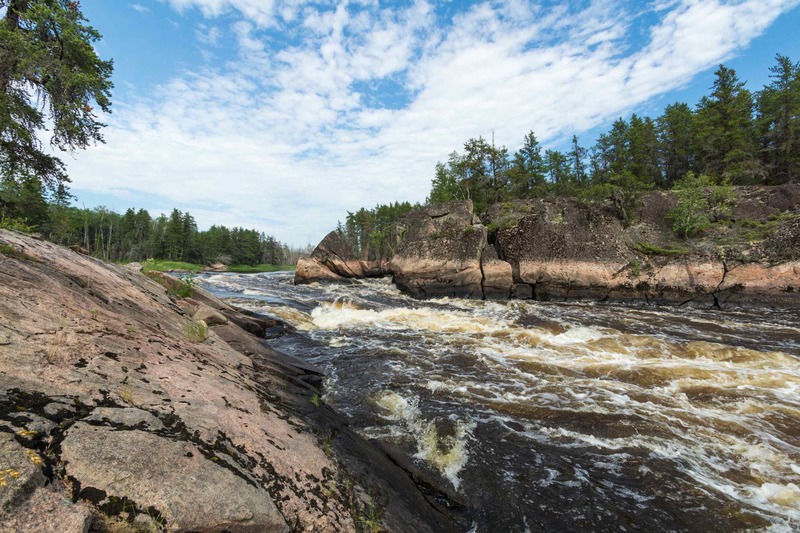 There is another option – you can come down on river left and bypass the 150 meter portage in favour of a 10-meter carry. We noted a campsite above the short lift-over. It would be an easier option if you were just passing through. At the very least it would provide a different perspective of Namay Falls than the one that you get from the main campsite. 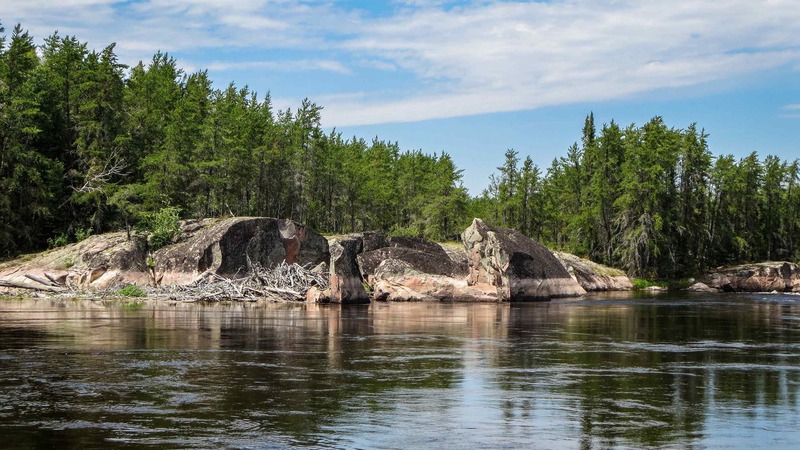 It was a Monday afternoon when we arrived at Namay Falls; we had arranged for a Thursday pick-up by Viking Outposts Air at Bloodvein First Nations Village. So we had two and a half lazy days to deal with a bit less than forty kilometers of the Bloodvein. However, just when you think you’re on Easy Street, stuff happens! The very next day we would spend a few hours dealing with the consequences of being just a bit too cavalier about a set of rapids. Tested at Kaokonapeekewonk (shortened to K.O.!) Rapids (W84) were our life jackets as well as the waterproofness of our pack liners and Pelican camera cases. 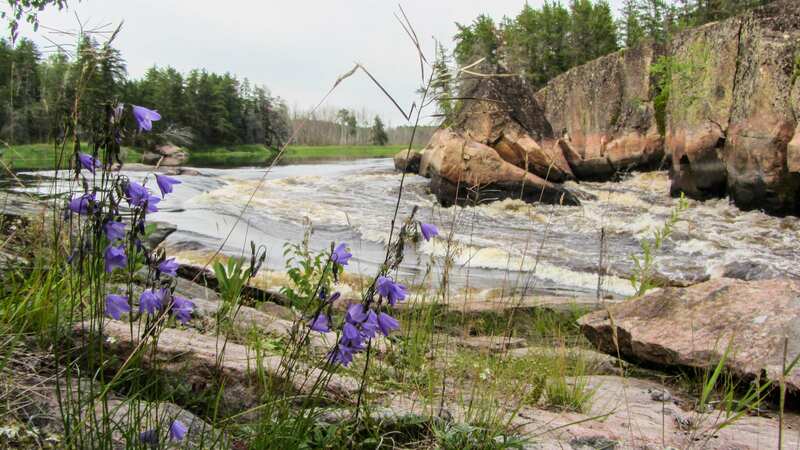 This entry was posted in wilderness canoe tripping and tagged Ankuasi (Driftwood) Falls on the bloodvein, bloodvein river canoe trip, Bloodvein River corridor, Bloodvein's Wayweekokanshok Falls, Namay Falls Bloodvein. Bookmark the permalink.